I am a baker at heart. I love to bake. I love making all kinds of different foods, but most of all I love to bake. I love to bake all the traditional recipes I have of my mother’s and grandmothers’. But, I love trying new recipes and am always challenging myself to learn new techniques in baking. Can you tell, I love to bake! However, I have not baked any sort of Gluten Free recipes until now. 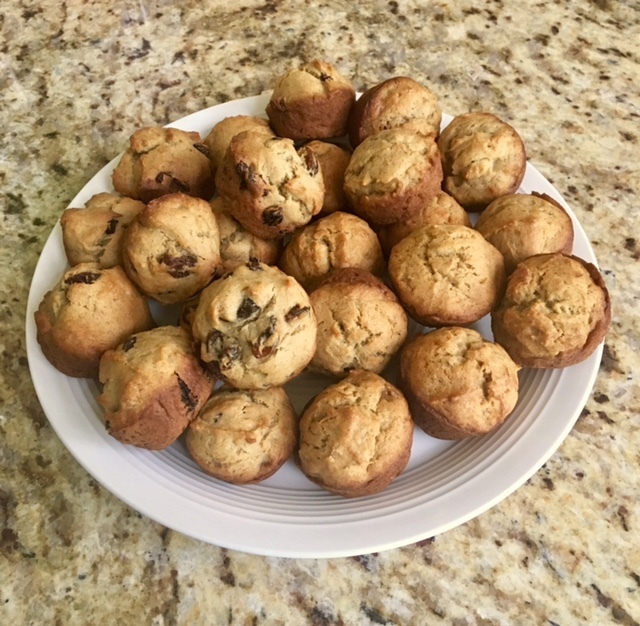 As more family and friends are going gluten free for different health reasons, I figured I would start trying and experimenting with making flavorful baked goods for them. Why should they have to be deprived of yummy cakes, muffins, and even pizza dough, just because they are eating food that is gluten free? This is where my Gluten Free Mini Banana Muffins recipe comes in. These perfect little bites are packed with all the flavor of traditional banana muffins. You can’t even tell they are Gluten Free. What makes that possible is the wide variety of flours you can find in your grocery store now. You basically replace the flour you use in your traditional recipes for the gluten free substitute. Using this flour, sometimes the consistency of the finished product is slightly more dense, but the flavor is all the same. I remember years ago when I was working at a bakery and they were experimenting with gluten free recipes, most of the baked goods came out like rocks. Boy, have times changed. There are so many products out on the market now that help bakers to create gluten free options, the delicious possibilities are endless. 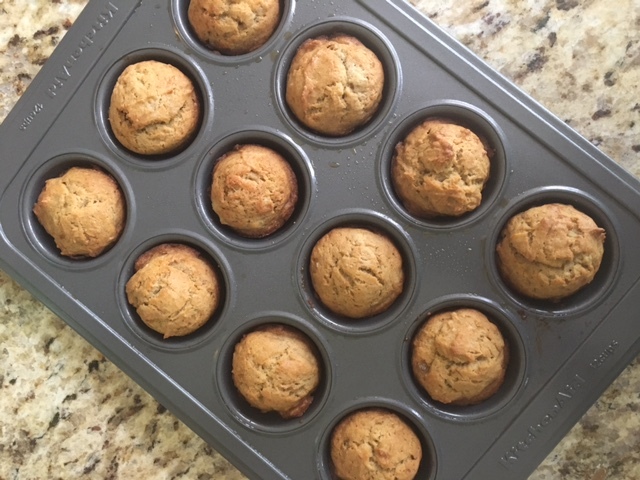 This recipe for Gluten Free Mini Banana Muffins is packed with ingredients that make it sweet, flavorful and super easy to make. 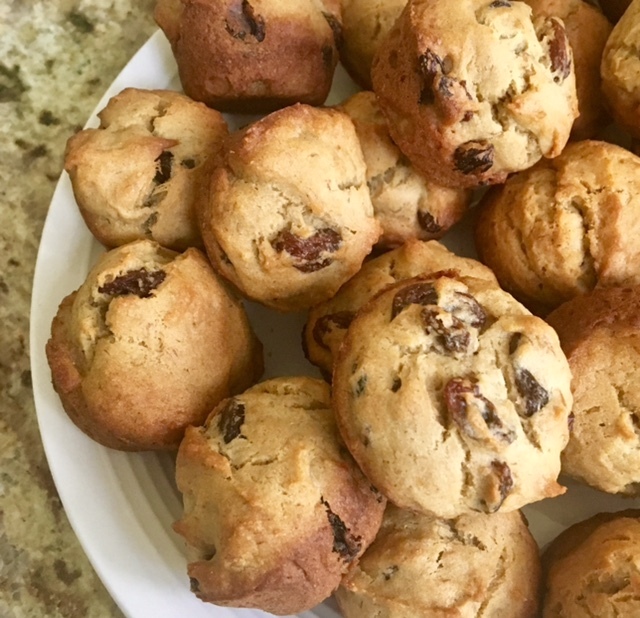 I like adding additional ingredients like raisins, dried fruit, mini chocolate chips or coconut for even more added sweetness and flavor! These little muffins are the perfect size for breakfast, snacks and a quick sweet with your coffee or tea. I am really excited to continue experimenting with new gluten free recipes. Now I can bake yummy treats for all my family and friends no matter what their dietary restrictions are. I think I have opened up a whole new world in my love of baking. Watch out, the Memorable Kitchen is ready to create! Happy Gluten Free Baking! Preheat the oven to 375 degrees. Prepare a mini muffin pan with nonstick baking spray. See note. Place the butter and oil in a medium mixing bowl. Add brown sugar and mix for 1 minute until smooth. Add in eggs, bananas, and vanilla. Mix for 1 more minute until combined. Add in flour, baking soda and salt. Mix until just combined. Stir in raisins or other add ins. Using a medium stainless steel scoop, drop by scoopful into prepared mini muffin tin. Bake 13-15 minutes at 375 degrees. Let cool 10 minutes in the pan. Turn out onto cooling rack and cool completely. Note: When doing Gluten Free baking, make sure you check that your cooking sprays are Gluten Free also. Not all of them are.